I had a busy Saturday this weekend with a viewing and a shoot – weekends are popular with my customers as I’m sure you would expect with any photography studio. On Sunday, the studio was free in the afternoon and so my wife and I took the opportunity to get a few pictures for our own walls. 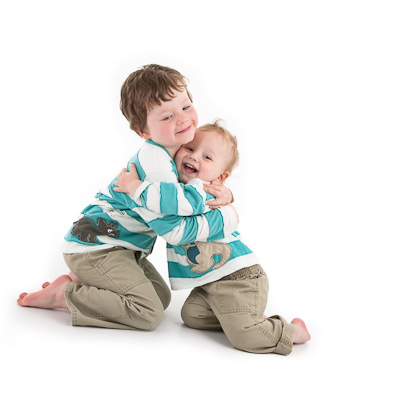 Our youngest, Jamie, nearly 2, is very generous with his cuddles at the moment and we wanted to capture him and his brother engaged in a cuddle – we think they look very cute together. Jamie and William wanted to see the results of their efforts immediately and so we had a viewing of the unprocessed pictures – I use an Epson projector aimed at the back wall of the studio for viewings.